At uv light near Rackensack Wash, Maricopa Co., Arizona. 11 Aug. 2016. Sonoran Desert Scrub, Chaparral, and Riparian habitats. Most moths fly at night and must hide effectively during the day and avoid being seen by sharp-eyed insectivorous birds. 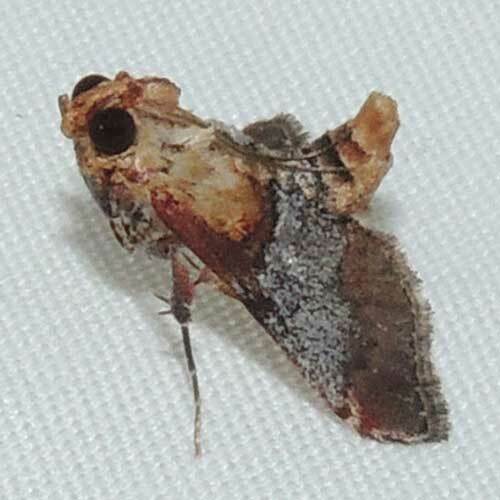 When perched on a tree branch this moth closely resembles a piece of the bark. By holding its abdomen up it adds to the look of a shaggy fragment. The large eyes are ready to detect motion - the insect will fly or drop to the ground if a bird has cracked its crypsis and is attacking.